After one of close encounters with fungus gnats and aphids, I thought about growing some kind of carnivore plants, that could make problems go away. Since carnivore plants also have issues with both, I would at least get some satisfaction, watching the pest being eaten by it’s prey. I decided I’ll try growing Drosera capensis, which is supposed to be one of the easiest carnivores to grow. Sadly it’s not cold hardy, so I’ll have to keep it inside – where the gnats are, but we actually have three varieties of Drosera growing locally. Perhaps I’ll plant those outside around the pond. I used peat and living sphagnum moss, combined with SiO2 based sand. I was in a hurry, so I skipped flushing the soil mix with distilled water. Chopped living sphagnum particles were evenly distributed throughout the mix and I was hoping sphagnum moss would start growing on top of the soil. First germination occurred around two weeks later. I was getting worried, because moss already started showing growth, ant it started sprouting all over the pot. I expected that I won’t be able to see the emerging seedlings as they start appearing. After 10 days I did see something green and after closer examination, it became clear that it in fact was small Drosera seedling. Drosera capensis seeds are incredibly small, so you need a camera or magnifying glass to see small seedlings. Since I haven’t wash the soil mix with distilled water before sowing, I later decided to try sowing into agar medium. Some of the seedlings disappeared during germination and whole top soil appeared to be slightly moving because of living moss which I added to peat/sand mix. Adding living moss ended as bad idea which I don’t intend to repeat. Tiny seedling with first pair of non-carnivorous (cotyledons) leaves. Despite a lot of effort to try and get as sharp photo of tiny seedlings as possible, pictures still look blurry. To snap tiny Drosera seedlings, you need macro lenses and tripod and I don’t have either. Interestingly, seedlings grow at different rates of growth. One of the seedlings that was the largest at first and received equal or even higher amount of light than other seedlings started to lag behind. It did start growing it’s second leaf earlier, but the first true leaf was smaller and it wasn’t carnivorous. When first seedling already started catching insects, with its one carnivorous leaf, whole bunch of new seedlings started to emerge. Just a couple of hours after I first noticed carnivorous leaf started showing dew on it’s tentacles, I noticed black spot covering it’s leaf. I was thinking about feeding it, but as it’s leaves were still far too small, it would be mission impossible. At first I thought it might be covered with small part of soil particles, or part of the seed coat. I decided to re-check it and try to get sharp photo of the leaf, so I spent a couple of minutes watching the seedling through the camera’s lens. Not only I saw that in fact it caught it’s first insect, I also noticed there was another one wandering around the seedling as well. They looked like black tiny beetles. The one that was still alive was a little bit larger and very fast for such small insect. I used living moss to prepare the soil mix, which quite possibly hosted a lot of living organisms. Interestingly, Drosera capensis seedling managed to attract those beetles extremely fast. Few days after first meal, it became clear that seedling which managed to capture an insect, started to grow faster and increased it’s mucilage production. I decided to feed it again, together with the second largest seedling. I found thrips (Thrips tabaci) on an onion and used a couple of nymphs to feed the seedlings. I used toothpick to transfer the nymphs onto carnivorous leaves. Two seedlings failed to grab the nymph off the toothpick, other two seedlings had enough dew to glue it onto their first leaf. Half an hour after feeding, tentacles started producing more mucilage and slowly started digesting their meal. First of the seedlings that germinated and appeared to grow fast, started to decline a bit before first carnivorous leaf formed. Leaf top became pale and it needed much more time to finally grow two small tentacles. It was a bit stunted and I hoped it’s not an issue that would harm the seedlings. Despite feeding, one of first two plants started to look strangely similar to the stunted seedling, it almost completely stopped growing. Growing leaf started to turn orange and I was happy to see that there were tentacles forming, but the formation was much slower than with it’s first leaf that appeared green. It also happened that the leaf on which the nymph was, got damaged one night. The nymph disappeared completely and there were like less than half tentacles left. One week after the feeding, the largest seedling also started growing orange leaf, but this time only “cap” was orange and it seemed to grow at normal speed. Apparently, when seeds germinate, they grow faster and are prone to coloration caused by intense light. Same thing happens after feeding, when plant starts to grow faster. When at one point plant get stressed by intense light, its growth slows down and it starts to adapt. Whole bunch of black bugs got caught at the same time. At one point two largest seedlings caught a lot of black bugs at the same time. What caused it? At one point when nymph got digested completely the same seedling somehow attracted whole mass of tiny black bugs onto it’s second carnivorous trap. The same day I’ve notice another seedling with trap that also got lucky. Strange thing is, there were also other traps on smaller seedlings all around the pot, but they were the only ones that managed to capture anything and they both caught a lot. It’s certain, that the pot is full of these tiny black creatures crawling around and that they often end up being caught by seedlings. Perhaps other traps lacked dew or were simply not sticky enough to capture anything. I realized that using living moss wasn’t so bad idea after all. I inoculated the pot with abundance of living plant food. If they also ate mold and partly digested insect carcasses, small ecosystem was perfect. One morning, I noticed there was whole pile of bugs on one tiny trap. That completely ruled out my thoughts that these bugs randomly roam around the pot and get caught when going over drosera’s traps. Well, actually, that is most likely true, but they tend to gather around their dead or captured siblings. Perhaps they were mating and the first one attracted whole group that also got caught. Another option that I can think of is, that they are carnivores and they eat dead insects. I lean forward to the ‘mating’ answer, because there were just too many in the same trap and I don’t think they can sense food that well. If I’d known what these black insects were I could do some research. After a lot of research, I found out that springtails act exactly like these tiny black creatures. Females use pheromones to attract males, which explains why there are piles of bugs caught at the same time in the same trap when female gets caught and why there’s only one springtail caught when male gets trapped. I searched for various springtails and tried to identify the creatures. It became apparent that they are Globular Springtails. I don’t have equipment to close up and view more detailed photo of springtail, so I had to use my digital camera and close up as much as possible to get the best idea about its shape. My guess after internet research i did is, that these black springtails are in fact Sminthurinus niger globular springtails. They usually don’t do any damage to plats and feed on fungus, which can be beneficial in moist environment I grew carnivore plants in. One month after germination, seedlings looked more and more sickly, some of them lost dew and it became evident that with time all the seedlings started to show signs of stress. New leaves did not grow completely and some of the leaves even turn light brown and died. I figured out that light level plays no role in their decline, the real reason was the soil. Seeds that were planted in pure peat were all growing into healthy green seedlings with a lot of dew. At that point, I decided to transplant all remaining seedlings into another pot. A couple of seedlings were already too damaged to survive the transplant, but many had shown some improvement. I covered the pot again to increase humidity and to make sure the dew appeared again. The largest seedling started to decline before it got transplanted and it’s two leaves that were already growing for some time failed to grow tentacles. They were stunted and damaged, but in the middle of the seedling new leaves started turning from pink to green in just a couple of days. Drosera swiftly recovered. Dew appeared again and new leaves had fully developed working tentacles. Two months old seedling. This one really took off. Other seedlings are also growing but at much, much slower pace. When Drosera capensis start growing large enough leaves, it gets easier to feed. Small ants and flies are its natural diet. A week after feeding, growth always speeds up. Sadly other seedlings don’t show the same kind of vigor. Drosera capensis flower. Flowers only last a few hours, but when they start, they set new flowers for quite some time. One of the leaves with it’s prey. That’s how it looks 8 months after it germinated. Each seedling is starting it’s second flower stalk. I’ve been somewhat worried about huge amount of sunlight they received during the summer and because of heat that exceeded 35°C for quite a while. I noticed they not only survive in those conditions, but actually love it. They loved occasional flooding in the hottest weather and also didn’t mind when peat got a bit drier. I’ve learnt that Drosera capensis is quite tough and the only thing it did harm it (a bit), was rain. They don’t seem to like getting wet. 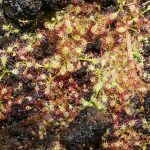 This entry was posted in Aquatic plants, carnivorous plants and tagged in Aquatic plants, capensis, carnivorous, carnivorous plants, drosera, Seedling.